Bryan is in the 1st of 6 years of his urology residency, as many of you know. This first year, he is a general surgery intern, which allows for him to learn the basics of surgery and managing patients. Being an intern, he works a lot. Like, a crazy amount - usually around 80 hour weeks. We try to maximize our time together because any chunk of time we have together is precious! Whenever we both have a morning free, which is very rare, I try to make a delicious breakfast because I absolutely love breakfast food. I ran across this recipe a long time ago, and I finally had a chance to make it for us over the Thanksgiving weekend! 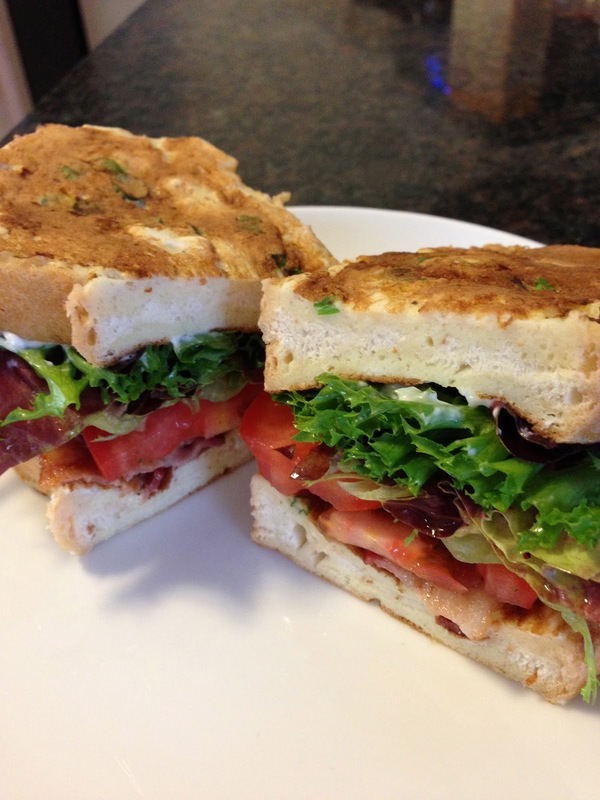 French Toast BLT's - seriously, genius. Whoever thought of this idea was on top of their game. These little sandwiches were so amazing that I can't wait for another opportunity to make them! Since the holidays are coming up, maybe some of you will be inspired to create these fancy little BLT's to impress your guests! Cook the bacon until golden brown and crisp. Keep warm in microwave or oven until ready to serve. While bacon cooks, whisk together eggs, cream, chives, parmesan, and flour. Season with salt and pepper. Lay bread in single layer in large shallow dish and coat with egg mixture. Soak 20-30 mins, turning once in the dish to allow for proper soaking. Next, cook bread as you would cook French toast. We use a nonstick pan, so I don't use any butter or cooking spray. If you use a skillet, melt butter or use cooking spray to prevent sticking. Flip bread when the egg is brown and crisp. Keep cooked pieces warm in microwave or oven until ready to serve. To assemble, layer tomato, lettuce, and bacon on a slice of French toast. Top with another slice or serve open faced. Another great addition that we thought of as we were devouring these babies would be to add sliced avocado if you like. Enjoy!